Met Ralph, Stetson and Vern at the Fernandina Beach City Marina around 9 am. These guys had come down for the annual Florida/Georgia football game and worked in a Fernandina Beach fishing charter trip which turned out to be a great day. We left the dock and headed to our first inshore fishing spot on the Nassau River. We had live shrimp and mud minnows to fish with under a floating cork. 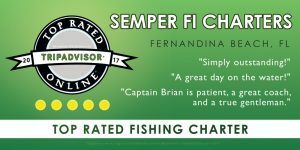 Vern stated he had not done much inshore charter fishing and I said not to worry, that I would show him. Ralph and Stetson got their lines out in no time. I showed Vern how to hook the bait and proceeded to show him how to cast the Penn 3500 reel and rod combo. I made the first cast for him so that he could see what I was doing. It was only a couple minutes when Ralph hollered at Vern that his cork was under the water. Vern got the hook set and started reeling in the fish. I told him to keep his rod up and reel nice and steady. I netted the nice 17-inch speckled trout. Stetson was next to get in on the action, another good slot trout. Everyone was getting bites almost at the same time. The bite was hot for about 30 minutes. When the bite slowed I would use the trolling motor and move down about 40 to 50 yards, power pole back down and the guys would cast back out. We stayed in about 5 ½ to 6 feet of water. The trout would almost immediately start hitting the baits as soon as the corks hit the water. We had a lot of good keeper trout in the cooler. We kept this up for a couple hours when I see some bait working along the edge of some grass and all of a sudden, a swirl and the bait scattered. I got Stetson to grab a rod with a Carolina rig and I hooked a live mullet on the circle hook. He made a perfect cast to where the fish was. The line just started to scream off the reel and Stetson set the hook and the battle was on. The fish would keep taking the line out and Stetson would gain it back. This went on for several minutes. He finally got the upper hand and after a while, the mammoth 30-inch redfish was landed. Some pictures were taken and the fish was released back into the water. 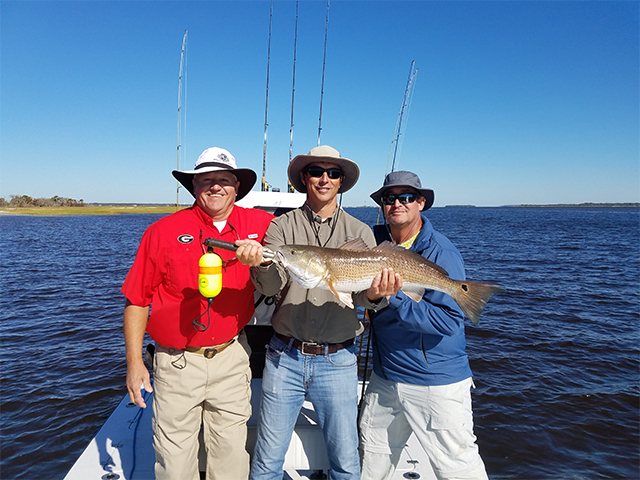 We caught a lot of trout on this Fernandina Beach fishing charter trip and a good time was had by all. I got the fish cleaned and the guys went over to the Salty Pelican for a great lunch.